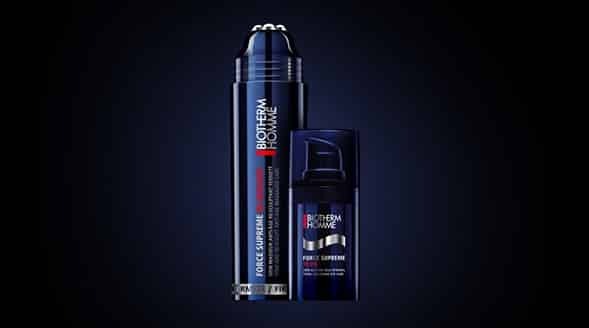 Biotherm Homme Force Supreme Rebuilder. The first product I was lucky enough to try from Biotherm Homme’s anti-ageing range is the Re-Builder, a facial roller-ball massager that releases an powerful oil free serum. The serum contains caffeine to reduce bags and calm the skin and soy protein to visibly tone and tighten the skin. There’s also Kreatilane, which supposedly revitalises cell activity and reinforces the foundational tissue of the face. So now for a closer inspection away from the spiel to the ingredients list. It confirms the information in the leaflet, with caffeine, soya, as well as cicer seed extract and castor oil to moisturise. The product does contain a little fragrance but it’s pleasant and not at all overwhelming, and didn’t cause me any sensitivity. So the test: following the instructions, I massaged over the chin, the cheeks to the temples, then on the expression lines around the nose and mouth and finally over the eye. Everything felt immediately cooled and the skin felt fresh. The product sank in very nicely without the need to massage in as the box suggests you might want to. Obviously being 20, I’m not doing too badly with any lines and wrinkles so far, but an ounce of prevention is worth a pound of cure! Overall a very pleasant easy to use product that leaves my skin comforted and hydrated! Biotherm Homme Force Supreme Eye. A beautiful eye cream with Pro-Xylane and cedar bud ‘to help restore a denser, smoother and firmer looking eye area’, resulting in visibly faded lines and wrinkles, bags and dark circles. Ingredients wise, it’s pretty packed, tocopheryl acetate provides vitamin e, as well as silica providing the light diffusion and giving those visibly reduced wrinkles effects. Finally it’s fragrance free! Yay! As all good quality eye creams are, as fragrance can cause irritation more so around the eye area than anywhere else. The eye cream is wonderfully rich, but sinks in incredibly quickly with no real residue. The eye area feels immediately comforted and feels even more amazing after using the aforementioned rollerball. After all day use, my eyes still feel well hydrated when often they can begin to feel a little dehydrated. This product is definitely worth a try! Biotherm Homme Force Supreme Rebuilder £45.96/50ml at Boots and Biotherm Homme Force Supreme Eye £31.66/15ml also at Boots, so you can get some serious bonus points here! This article first appeared on MANFACE written by Thom Watson. It was published on Wednesday 11th January 2012 and was last updated on Monday 3rd April 2017 at 4:31pm. It's categorised under Anti-Ageing, Biotherm, Dark Circles, Eye Care, Moisturise, Special Care where you'll find more related content.